Try our Ecological Footprint Calculator to measure your impact. Our mobile-friendly Footprint Calculator is now available in six languages at www.footprintcalculator.org. Your free access to our Footprint Calculator is made possible by the generous donations of other calculator users. Please "pay it forward" now to give additional users access. 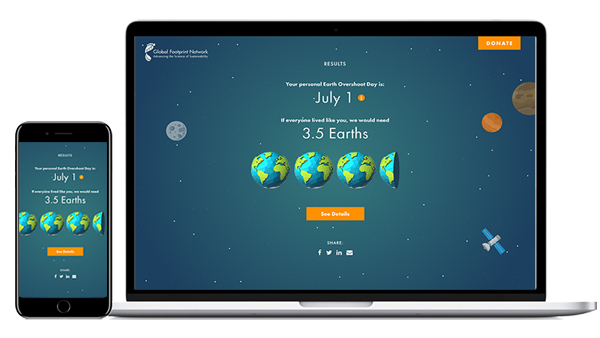 Try our new Footprint Calculator at www.footprintcalculator.org to find out your Ecological Footprint and personal Earth Overshoot Day and learn about solutions to help us all tread more lightly on the Earth. Please see our troubleshooting tips for more information. Are you a student or educator using our calculator? If so, please share your experience using the calculator by emailing media@footprintnetwork.org. We are collecting stories for a campaign for phase two of our mobile-friendly version of the calculator, which includes plans for an administrator platform for teachers. Why are my results on your new calculator different from the previous calculator? Our former calculator was several years old. Global Footprint Network updates its data and methodology every year. Our new calculator features our latest data and methodology and will be much easier to update each year. Why can’t I choose my country and language on your new calculator? The Calculator is currently available in English, French, German, Hindi, Italian, and Spanish. To create country-specific calculators, Global Footprint Network works with local partners to gather regional data on resource consumption. Global Footprint Network is inviting corporate, government, and NGO partners to help us add additional cities, countries and languages to our new calculator. Please contact us if you would like more details. More questions about your Footprint? Please see the Footprint Calculator Frequently Asked Questions (to be updated soon). Subscribe to our newsletter for the latest calculator news. 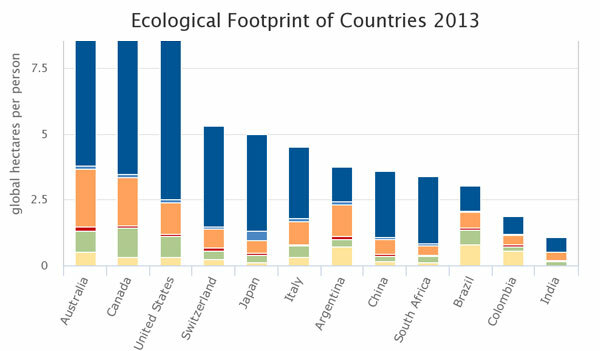 Want to know how your Footprint compares to your country average? Visit our new Ecological Footprint Explorer open data platform!